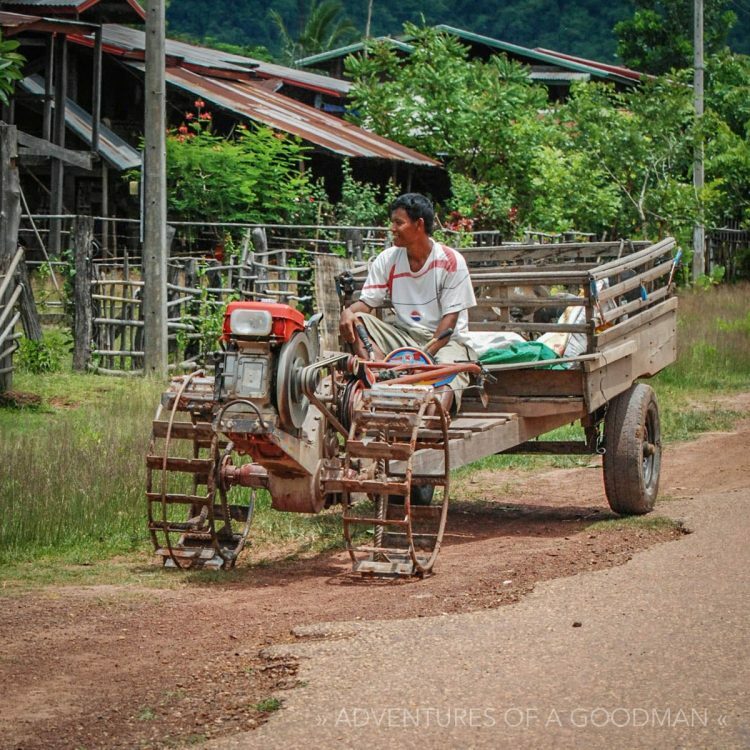 From taxis to buses, vans, tuk tuks, boats, trucks, cars, tractors, motorcycles and animal-drawn carts, Laotians sure do have a lot of ways to get around. Here are the ones we encountered during a two week visit to Laos — and our experiences with them. Like most countries, Laos offers tourists pre-packaged ways to get from one popular destination to the next at a price way higher than local transportation. The advantage of taking one of these AC minivans or comfy first class buses is that they pick you up at your guesthouse and take care of all transfers along the way. Overnight trips are taken on sleeper buses that literally have beds instead of seats. Some beds are big enough for one, others have space for two, though barely. The twin beds are very narrow and too short to lay straight on the back. This worked out fine for Carrie and I since we just curled into a ball and fell asleep next to each other, but we know some people traveling alone who got stuck with random strangers in their bed. While we sometimes took the packaged buses, we also tried to do it ourselves in order to pay less and travel like the locals. While we always got to our destination, we often found that it took far longer, was more uncomfortable and cost just about as much. We still got the foreigner price, even on local transportation, and got none of the frills. Still, that didn’t stop us from trying. Take an oversized, rickety and old flatbed truck. Put benches on either side of the cab and possibly a third bench in the middle. Then put a canopy attached to poles overhead and cram on as many people as humanly possible. That’s a songthaew and the most common way to travel as these are the only public buses offered. Bags, chickens, bikes and anything else people carry are placed on the roof or tied to the rear bumper, which usually has an extended grate for stepping or storing. On one particularly uncomfortable three hour ride from Champasak to the 4,000 Islands we joined 21 other people in the back of a songthaew, bumping our way over potholes and dirt roads. Tied to the back bumper were about a dozen pigs in a wicker basket and a few more stuffed into sacks: all tied down with rope, squealing and sending their stink wafting into the songthaew. I had a guy next to me for a while who used me as a pillow. Carrie was pointed at and discussed in the local language for a few minutes after we got on. Best of all, we paid as much as we would have if we had taken the AC bus. Gotta love traveling! In towns there are other types of songthaews that are a hybrid of pickup truck and tuk tuk. Maybe 10 feet long, they run on three wheels, have a single seat up front for the driver and a cab-like back with benches on either side. They hold less people than their truck counterparts and go way slower, which is why they are not used for long distances. Aside from the songthaew tuk tuk, Laos also has smaller versions of these popular Asian taxis. Still using only three wheels, the driver sits on what looks like the front half of a motorcycle (it is also driven like one) with an area to put his feet. The back part has two benches like a songthaew but is significantly smaller and can fit only four people (as long as they don’t have bags) comfortably…or as comfortably as one can sit on a wooden bench in a vehicle with no shocks. While we didn’t ride in any of these, here are some photos of other wheeled methods of transportation that locals use. With the Mekong running through the entire country as well as tons of other rivers and lakes, boat travel is very popular in Laos. Options range from speedboats to ferries, motorized canoes, barges and even a long wooden boat big enough for hundreds.